The reviews of HAL out here lately have been snarky. We had a lovely time some years back in Canada on the Veendam. For some reason we strayed – but we can’t remember why. I had one open week in March and searched on price and a few of my criteria. The Rotterdam was the cheapest for ocean view- and for Mariner members we got $100 off on HAL.COM. One thing to watch for on OV on some Holland ships- they are nice and big and have a couch- (and even a bathtub). But a top grade (HH) can be obstructed view literally on Lower Promenade. DH did not trust the one way glass tinting- as people could possibly see in as they walked by. We booked a specific porthole (1815) down on deck one “Dolphin” - and were amused to get three “urgent” upgrade offers back up to HH- starting at $69 pp and the last was $19 pp. We had one 110V outlet, one German (250V/50hz) outlet and 2x USB charging ports. Tampa is usually a low cost air destination for us. I saved a little and booked a connecting flight- why I asked myself after a four hour delay. Ubers are cheap and abundant. The cab from the airport asked for $26 not on the meter, six over Uber XL and DH rolled her eyes and tipped him poorly. The chain hotels were pricey the start of spring break. We tried the Tahitian. The reviews were mixed. The pool and grounds were good. It has a smallish main building with a 1970s motel out back. There is no one from chain headquarters to remind the owner he needs to write a check and fix stuff like beds, bubbling plaster and clock radios or lose his franchise. The little breakfast/lunch café inside was excellent- the Tampa Police eat there. There is a cute residential neighborhood out back. Embarkation at 11 AM was less than optimal. We were too early, yes, but Terminal Six has not enough chairs. So get there at 11:30 and you proceed to the gangway and not have to stand in line after your speedy check in. Actual boarding started at 11:40. The ship is lovely and being very aggressively maintained – new carpet, paint, piping etc. The crew was cheerful and the art is really top notch. Rooms were ready at 11:45 AM- who ever heard of that. We ate embarkation lunch in the MDR. The selections were just right. The Cajun items had un-spiced sausage but they did a good job on vegetables and soups. Dinners were also good- we had aft facing sharing tables for eight and the conversation was really great – four couples our age with 15+ cruises each. Note the average passenger age was up there. The wine prices were high to us- $9 is apparently the norm -but they had three IPAs. One was out of stock but they had a Florida one that was not bad. A few tap beers are available here and there. We were so excited to see the Oceans Quartet (sometimes or formerly called Neptunes) with four sets starting at 7PM or even 5PM. The dance floor is smallish (14 feet by 14 feet or so) but the band was very good- the guys are from Mexico and will be on the ship until May. Several couples were dancing. One of the dancers said they were playing all jazz the previous week but I went up and begged for some Latin – and it was amazing. A piano player was there in between sets. If you know the Foxtrot Box Step- it is handy on a small floor. Up the way there was a piano bar player- he was well regarded- Barry from Boston. The casino was packed and a bit smoky. There was no actual production show- this caused some grumbling– replaced by a movie. Others seemed OK with the movie. There was comedy a few nights. Both were good and one of the comedy shows had music (we won’t give it away). There was a musical show- Postmodern Jukebox that was only OK but way over hyped. If I was HAL I would being back a smallish production show. The reports on the Test Kitchen were positive. As I write this is it 5:45 AM in the lounge/coffee shop/library aka Explorations Cafe. There is no library on the deck plans but there are actual books, puzzles, board games and no piped in music. The coffee shop opens at 6:30. For a transatlantic or world cruise this is an excellent and large space- and very under-rated. We had our Cruise Critic unofficial meet and greet around a giant puzzle. They need a few electric outlets, and there is a wooden book sculpture that takes up a whole writing desk and needs to be recycled. I found a wireless laser printer which was good for boarding passes etc. The ship has an aft pool. These are nice and a good way to enjoy the sea views. Key West is a good port. On our third trip there we hunted for the free bus, which for us was like a unicorn and hard to find. 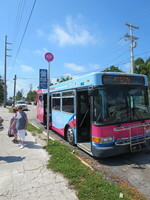 Two important clues- it is called the Duval Loop and is a smallish city bus. There is a commercial trolley-bus and a wheeled train. The Duval Loop has red circular signs marking the stops. It was very full when we rode it and the commentary was safety vs tourist focused. The Southernmost Beach Café was again excellent and we found Turkish trivets and key lime jelly beans on Duval. The funny and interesting port talks downplayed Porto Tomas in Guatemala. The message was, over and over, buy a shore excursion or else you will be bored and disappointed. Some of us took the or else- many staying on the ship. There was hint you could walk out the gate of the container port by the craft market, go straight a block then right around the miniature naval station to some waterfront restaurants. At least one showed up on the online rating sites and can be seen from the ship. We dropped into Donde Pilo which seated us over the water on a thatched roof dock. They were sweet and friendly and recommending the large lobster seafood soup for $20. Some friends who arrived by power wheelchair had a huge fish. Divide all local currency prices by 7. We looked for and saw several crew. If they are trying to promote the port in the bigger picture I would humbly suggest to HAL and the Tourist Board to rent a few golf carts and shuttle guests over there. 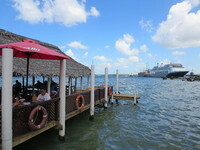 It is a similar look, feel and walk to Senior Frogs in Nassau. Pro tip- the local beer was $2. The craft market at the pier had pretty local crafts – I got two nice hand made belts for $20 each. Taxis to the actual town, a few miles away, were like $10pp round trip. Service in the MDR was cheerful but slow. Breakfast food was lovely – lots of choices- full English, waffles and even Asian. But they would take 45 minutes and ask for juice two or three times etc. We diagnosed the issue as “stay in your section” by the Head Waiters, vs “go and help the guests or supervise” – which is easy to fix and we dropped in a note to the Hotel Director. Dinner was slow but everybody was pitching in. MDR Lunch was efficient. They were not serving in the MDR on port days, so we tried “Dive In” by the covered pool – which has a taco bar also and a good chicken sandwhich. There were rumors of a shortage of limes aboard. I cornered a senior beverage person, who stated they have to use certified (food safety?) suppliers, such as those back in Tampa, so just racing off to buy a case of limes was just not possible. I complimented him on the wise decision to carry several IPAs. He hinted they would have more but there were issues with shelf stability. He did acknowledge the cost of them was also a factor, and that guests were “crazy for light beers.” The founder of our local (large) microbrewery at home, Summit, makes of big point of his decision to hire a chemist and build a lab to work on shelf stability as he tries to expand nationally. This may be a helpful clue as to why there not more craft beers on cruise ships. We were baffled by the real world dress code aboard. Yes the published one was easy to follow. Dress to Impress aka Formal Night was the big question. So, based on a sample size of say 100 people I noticed (this is valid sample size I think), the average for men was sport coat and tie. We saw a tux or two and quite a few business casual. Mahogany Bay is a dedicated cruise ship port. The Captain mentioned the entrance was narrow and challenging to back the ship into in high winds, but everything was just so. The grounds were manicured, the shops air conditioned and the beaches sandy. There were life guards and lots of security. We had a dip in the ocean. The online drawings and photos show the place as barren but the jungle has filled in and it quite pretty. There were lots of lounge chairs and shade available. We enjoyed the signs on some of the exotic (to us at least) trees and flowers. Costa Maya seemed the same and massively crowded. We stayed on the ship. The gentle rocking at the open sea pier made it like a sea day. We read books and went for several walks. MDR breakfast service settled in. I did some asking around – this is a happy ship- with high guest satisfaction ratings. I have noticed a correlation between happy ships and good ratings on places like Cruise Critic. You can tell if the crew is enjoying their (hard) work. We were impressed by the towel animals – Riston (covering the whole forward-odd side of Deck One up to about 1857) designed an amazing elephant, sleeping dog and monkey- the best we have even seen. They did not seem to use cleaning carts which can block the hallways. Nice and quiet. A nice couch. Plenty of closet space. Riston the steward makes great towel animals.